A chance to be part of one of the coolest art fairs during Art Basel Week, definitely check it out! 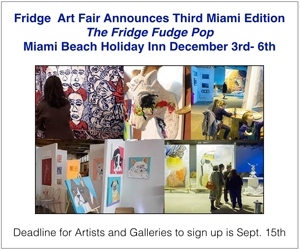 Call details: Fridge is an indie art fair open to galleries and artists 18 + from any country. A small curatorial board will review all materials submitted. By particiapting in Fridge Art Fair, you agree to let us use your images for purposes of marketing the event. 50% deposit is due within 2 days after acceptance email have been sent from Fridge Art Fair. Full amount is due within 30 days after acceptance email have been sent from Fridge Art Fair. Fridge Art Fair reserve the rights to cancel spaces/booths if payments are not received in time. We will do everything to work with you in terms of payment for space. Wifi and chairs are provided. There is a $10 submission fee, If you are selected to be part of Fridge Art Fair the submission fee will be deducted from the total invoice.